AUTHENTIC RIAA CERTIFIED GOLD RECORD AWARD. Presented to ERIC CARR, for Kiss Album. “CREATURES OF THE NIGHT”. This award comes directly from the Eric Carr family and will come. Aprox 24×18 and is framed with a BLACK FRAME, each item from the GOLD Record to the cassette. Has a 1/4 Inch blue double matting on top of a black matted back, giving each part a 3d effect. This comes with a handwritten COA from a Carr family member which assures it’s authenticity. The engraved Plaque Which reads. 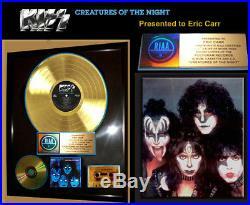 PRESENTED TO ERIC CARR, TO COMMEMORATE RIAA CERTIFIED GOLD SALES OF MORE THAN 500,000 COPIES. OF THE MERCURY RECORDS, ALBUM, CASSETTE AND C. It is next to impossible to obtain an award with the Actual name of a Kiss bandmember. THIS WILL MAKE YOUR ERIC CARR AND KISS COLLECTION, COMPLETE! This was presented to the family after eric passed, it is not the original Eric Carr received by Eric Carr. The Award is in Mint condition. HAS A RIAA CERTIFIED HOLOGRAM. This will come with a signed COA with Serial number from a Carr family member. The item “Authentic, KISS, RIAA GOLD RECORD AWARD! CREATURES OF THE NIGHT” is in sale since Thursday, February 7, 2019. This item is in the category “Entertainment Memorabilia\Music Memorabilia\Rock & Pop\Artists K\Kiss\Other Kiss Memorabilia”. The seller is “scruffy712″ and is located in Lyndhurst, New Jersey. This item can be shipped to United States, Canada, United Kingdom, Denmark, Romania, Slovakia, Bulgaria, Czech republic, Finland, Hungary, Latvia, Lithuania, Malta, Estonia, Australia, Greece, Portugal, Cyprus, Slovenia, Japan, China, Sweden, South Korea, Indonesia, Taiwan, South africa, Thailand, Belgium, France, Hong Kong, Ireland, Netherlands, Poland, Spain, Italy, Germany, Austria, Bahamas, Israel, Mexico, New Zealand, Singapore, Switzerland, Norway, Saudi arabia, Ukraine, United arab emirates, Qatar, Kuwait, Bahrain, Croatia, Malaysia, Brazil, Chile, Colombia, Costa rica, Panama, Trinidad and tobago, Guatemala, Honduras, Jamaica, Barbados, Bangladesh, Bermuda, Brunei darussalam, Bolivia, Ecuador, Egypt, French guiana, Guernsey, Gibraltar, Guadeloupe, Iceland, Jersey, Jordan, Cambodia, Cayman islands, Liechtenstein, Sri lanka, Luxembourg, Monaco, Macao, Martinique, Maldives, Nicaragua, Oman, Peru, Pakistan, Paraguay, Reunion, Viet nam, Uruguay.